Launched in 2016, Modern Gardens Magazine has shaken things up with its fresh, new approach to gardening magazines. It is the magazine for those who want their outside space to look great whether they have green fingers or not. Forget hours of weeding, tidying and waiting years for things to grow, subscribe to Modern Gardens and you will find out how to achieve your dreams and see fantastic results quickly. Every month, a Modern Gardens subscription delivers top tips and inspirational ideas to make your outside space as stylish and relaxing as your living room and as personal as your home. Modern Gardens takes on the hard work, showing you how to pick the most beautiful and easiest plants to grow, where to put them and how to care for them. It’s the only magazine to truly engage with the modern gardener, so order your magazine subscription today. Lush green looks for grass-free spaces… 10 stylish ways to use black outside… Revamp your space with a wall of glass… Inspiring new ways with garden trellis… Make a twinkling canopy of lights… Easy geraniums for clouds of colour… Clever ideas for a low maintenance plot… Treat your front garden to a mini-makeover… Top new trends for cooking alfresco… Make a hanging ball of fragrant flowers… Perfect pots for spring bulbs… 17 stylish ways to update your patio… How to turn your fence into a feature.. Order your Modern Gardens subscription today for more inspirational features like this in every issue. Your dream garden starts here! Who Reads Modern Gardens Magazine? Keen gardeners who enjoy the more quirky and less intimidating approach of the magazine. 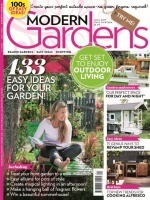 Modern Gardens talks to a new, younger, enthusiastic gardening audience with 50% of readers aged between 30 and 50. It’s not your usual boring gardening magazine.